（May 18, 2016 The Japan Times） With this summer’s Rio de Janeiro Olympics just around the corner, sports are currently very much in the spotlight. 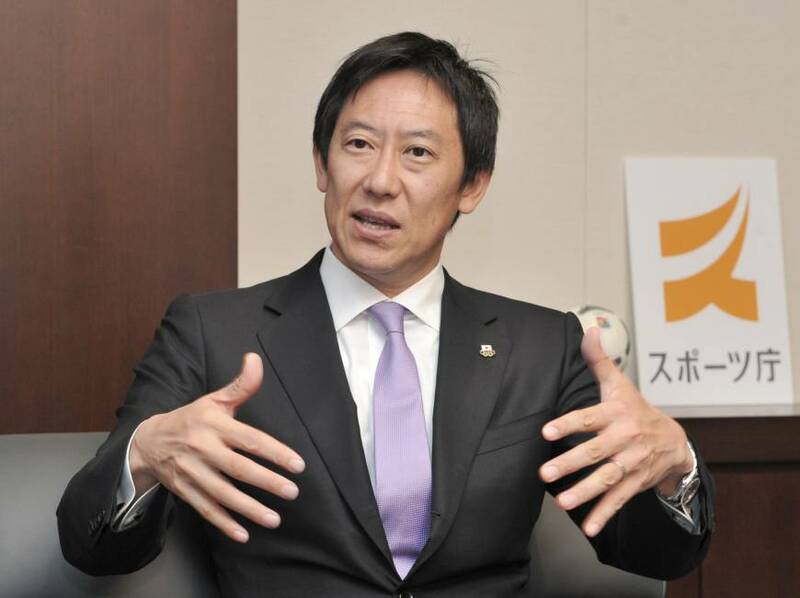 Having been involved in sports for decades, both as an Olympic swimmer and administrator, 2016 is a key year for Daichi Suzuki, the inaugural commissioner of the newly launched Japan Sports Agency. In an exclusive interview with The Japan Times last month, Suzuki, 49, said that August’s Rio Games would be enormously important for Japanese athletes leading up to the Tokyo Olympics in 2020. He had already announced that Japan would aim to clinch a top-three spot in the medal standings at the Tokyo Games (Japan was sixth at the London Olympics with 38 medals). “Japan earned about 18 gold medals overall at world championships from different sports last year, so we would like to reach double-digit golds,” Suzuki said of his hopes for the Japanese delegation at the upcoming Olympics in Brazil. Suzuki knows first-hand how an Olympic gold medal can affect the general public. Suzuki, then 21 years old, claimed an upset victory in the men’s 100-meter backstroke final over then-world record-holder and race favorite David Berkoff of the United States to give Japan its only swimming medal at the 1988 Seoul Games. Suzuki had the third-fastest time in the preliminaries, yet boldly changed his strategy to increase the number of his signature underwater dolphin kicks from 21 to 27 in the final, which worked out as he beat the American and other rivals. “When Japanese athletes excel at the Olympics, they inspire children to have dreams and hopes,” Suzuki said. “And ultimately it doesn’t just apply to sports. It makes the public think that hard work can bring you glory. Meanwhile, Suzuki wonders about Japanese elite-level athletes’ awareness of their place in society in the wake of recent betting scandals in baseball and badminton. The Chiba Prefecture native emphatically believes that a winners-can-do-anything mindset should not be tolerated, adding that he has strong concerns over the issue. “It’s a problem that if you are good (athletically), you can do anything,” said Suzuki, who was once a collegiate scholar and earned a Ph.D in medical science in 2007. The Sports Agency began its operations last October as an external bureau of the Ministry of Education, Culture, Sports Science and Technology in order to integrate the country’s sports administration, which had been dispersed among multiple ministries. Previously, for instance, the education ministry had been in charge of elite-level sports and school sports, while the Ministry of Health, Labor and Welfare was taking care of sports for the disabled. Suzuki said that his agency loans government officials from various different ministries, and they are currently mediating with their own ministries to carry things out smoothly. The task to put together a vertically divided sports administration in Japan doesn’t seem easy. But Suzuki has a simple message for the agency officials: Do the right thing for the country’s sports scene, instead of just being loyal to their respective organizations. Suzuki added that the government has been cooperative so far. One of the biggest reforms that Suzuki wants to bring to Japan is to develop the country’s sports into bigger industries. The Gross Domestic Product for Japan’s sports industries is estimated at about ¥5.5 trillion, which is roughly one ninth of that in the United States. Somehow, making a profit through sports has been thought of as greedy and dishonorable in Japan, where many believe in the beauty of amateurism. Suzuki insists, however, that such a mindset has to change. The Sports Agency also promotes the “Sport For Tomorrow” program, which was initiated by Prime Minister Shinzo Abe at the 2013 International Olympic Committee Session in Buenos Aires and has been led by the foreign and education ministries. The program is meant to make an international contribution, such as providing sports infrastructures and technologies, dispatching coaches and exporting Japanese sports culture to other countries around the world, developing nations in particular. “Japan needs to be a leading nation in Asia in making international contributions through sports,” said Suzuki, who has also been a director for the World Olympians Association. Suzuki declared that the Sports Agency would place emphasis on raising the health of the general public and promoting sports for disabled people. He added that his agency also wants to attract the public’s attention more to sports for disabled people, because he thinks the awareness level is still lower than in other countries. But looking on the bright side, awareness is growing with Tokyo chosen to host the Paralympics in 2020.